When Apple introduced the Macbook Air 11″ in late 2010, I was excited. For years, I had been craving a successor to the wonderful Powerbook 12″, but none ever showed up. Finally, the MBA11 came remarkably close. On the first of december 2010, I ordered the biggest MBA11 configuration: 128GB SSD, 4 GB RAM, 1.6 GHz CPU, along with the USB ethernet adapter and a DVI adapter. I used Apple’s migration assistant to bring the data (mostly iTunes) from my 2006 Macbook 13″, after which there still were 35GB available on the MBA11’s SSD. Unfortunately, this is not enough to activate Filevault, which is somewhat annoying. I have all secret data in an encrypted DMG now, which really is a foul compromise, but at least, other than Filevault, it doesn’t make the system unstable. The 1.6 GHz CPU is slower than the majority of random notebooks from electronics stores, yes. No surprise here. Nevertheless, for my uses of the Macbook, the decreased performance only shows when converting raw photos. This is still doable if you are willing to wait a few seconds longer, but it’s not where the MBA11 really excels. Still, I have not a single complaint about CPU speed. 1.6 GHz may sound like 2003, but remember that there’s two cores and battery lifetime is likely much better than what you got from your 2003 Centrino conglomerate. On the other hand, the MBA11 is no toy from the Atom class, but capable of getting real work done. HD video playback on my DVI monitor is fine. As could be expected, the size of the keyboard is great. The thin ESC key can be irritating for UNIX types like me and needs some getting used to. Some adaptation is also required for the glass trackpad. Usability of that thing is somewhat counterintuitive. With the exception of the Ethernet adapter, I’m very happy with the MBA11. It’s so light and so small that it makes my 3 year old Asus U6, which was once considered compact, appear like a damn concrete slab. 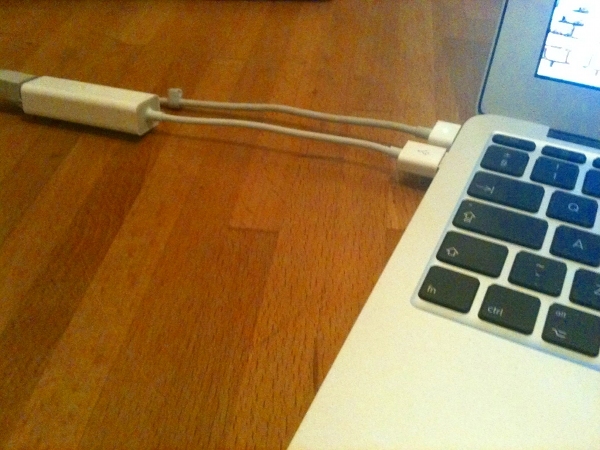 My old white Macbook 13″ looks downright archaic next to the Macbook Air. The small SSD is somewhat limiting, but as long as you are not going to carry around your movie collection, things will be fine. If you don’t need extreme performance numbers to feel great, and if you can live with 100Mbps ethernet in the year 2011, the Macbook Air really is the perfect notebook that you can carry with you everywhere you go. I’m glad to have skipped the “netbook” craze altogether and to have ended up with this great little machine. Der Footprint des Air entspricht auf den Millimeter genau dem des gemeinen Plastik-Macbooks und liegt somit weit oberhalb dessen, was man als Subnotebook durchgehen lassen kann. Die Chipsatzgrafik ist ebenfalls mit dem Plastik-Macbook identisch. Ein würdiger Nachfolger für das kleine dicke Powerbook 12″ läßt somit noch immer auf sich warten. Toshiba hatte bereits 2002 ein dünneres Gerät im Sortiment. Natürlich häßlich wie die finstere Nacht. Aber wenn wir das Spiel mit den Superlativen schon spielen wollen, dann bitte ohne Ausreden. Die Vorstellung neuer Macbook Pros ist mittlerweile höchst überfällig und die Enttäuschung darüber, daß Lifestyle bei Apple Vorfahrt zu haben scheint, wird auch bei den Fans jeden Tag größer.